A new Standard in Sealant. Current sealants dry out within months, losing effectiveness and leaving sticky cured latex inside tires and rims. These sealants require refreshing and most give off an irritating ammonia odor. 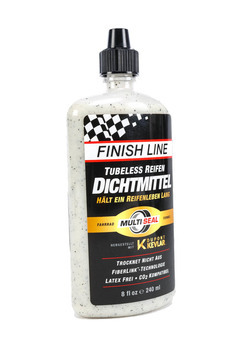 Finish Line Tubeless Tire Sealant will never dry out. It never needs refreshing and lasts the entire usable life of the tire. 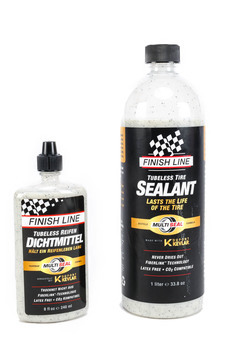 This perfectly homogeneous sealant never needs shaking and never separates inside the tire. Proprietary FiberLink™ mesh seals are reinforced with Kevlar®. This unique formulation is hypoallergenic, non-toxic and cleans-up with a wet rag. 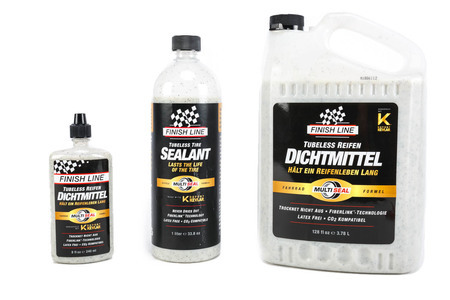 This innovative sealant sets a new standard for tubeless tyres: the new formulation is not only latex-free and less aggressive than its predecessors, but it also doesn’t dry up, thus giving it a longer shelf life. We selected this product for the green award because it results in the use of fewer tubes and tyres and also less solution. To make it even greener, though, we would recommend a rethink of the packaging.